Have you written a pony book? Writing a book is one thing, but thinking of a title for it is quite another. Do you tell the reader exactly what they’re going to get, or do you hint at it? Publishers in the past worked on the fair assumption that if you were looking for a pony book, the word ‘pony’ shoe-horned into the title would probably do the trick. And going by the evidence of the eighty years of so that the pony book has been going, they were not wrong. What do we want? We want a pony (and there’s a title for you for free, because as far as I know, no one’s snaffled that one, nor, oddly enough, He Wanted a Pony). Diana Pullein-Thompson kicked off her solo publishing career with I Wanted a Pony and Peggie Cannam followed with She Wanted a Pony. There were titles that addressed the fantasy of owning a pony: the iconic Wish for a Pony, followed by Dream Pony (a popular title, this one), joined by A Very Special Pony, The Magic Pony and The Paradise Pony and Jill and the Perfect Pony. How were you going to get that pony you dreamed of? There was the prosaic, and for most people, accurate, They Bought Her a Pony and A Pony for Sale. If you were going to have to rely on your own resources, well, then there was Quest for a Pony, The Pony Hunt and The Pony Fund. Or maybe you could win one. Jackie Won a Pony. Wendy won one too in Wendy Wins a Pony, and so did Tessa in The Prize Pony. The Pony Raffle might have turned up trumps for you. If you weren’t lucky enough to win a pony, and had to pay for it, Margaret Stanley Wrench was prepared to ask that question for you in How Much for a Pony? Answers came in the form of The Penny Pony, Pennies for a Pony and The Bob-a-Job Pony, and, showing the unfortunate effects of inflation, The Ten Pound Pony. Some authors had more imaginative solutions than simply buying a pony. Lucy Daniels had A Pony in the Post. 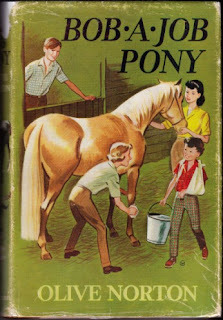 Myrtle Ellen Green came up with The Part-Exchange Pony, and one of my particular favourites here, A Pony – Doctor’s Orders! Would that have been a solution to Pony Madness, I wonder? If only ponies were available on the NHS. The word ‘pony’ was tacked on to all sorts of things: The Pony Picnic, Black Pony Inn, and The Wednesday Pony. There were Pony Tracks, The Pony Clue, Pony Plot and Pony Sleuths. There were Pony Jobs for Jill, and Sue had a TV Pony. And then two books which really should be shelved together: The Strawberry-Jam Pony and its friend, The Marmalade Pony. There were titles telling you pretty much all you needed to know about the pony: Misty the Grey Pony, Asido the Mexican Pony, Sheltie the Shetland Pony, Molly the New Forest Pony (and Trusty our New Forest Pony), and another of my favourites, Hua Ma the Flower Pony. And The Pink Pony and Rebel Pony and The Wild Pony and the No-Good Pony. And there were ponies to pull on the heartstrings: Nobody’s Pony, Second Best Pony, and The Lonely Pony. And if there were plenty of books devoted to getting that pony, there were certainly those where the opposite was true: The Lost Pony for a start. Mary Treadgold had No Ponies, where the ponies had disappeared in the aftermath of the Second World War. Sticking with the theme of doom, she wrote The Rum Day of the Vanishing Pony. Mary Gervaise wrote an even rummer story where ponies vanished through cracks that opened up in the ground into underground caverns in her The Vanishing Pony. 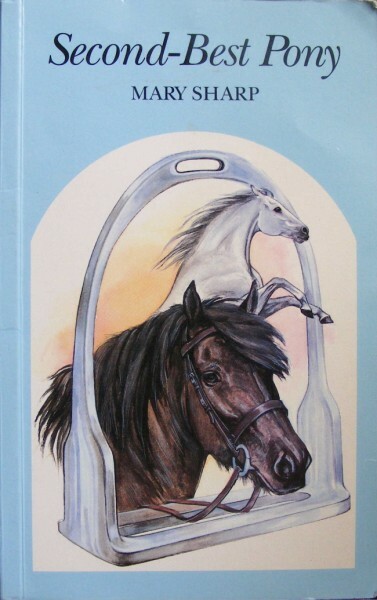 Josephine Pullein-Thompson wrote I Had Two Ponies about a girl who sells both her ponies in the first chapter. And then comes to regret it. .More recently, there’s one of my personal favourites, Trixie and the Dream Pony of Doom which sounds like the sort of pony that if you had it, you’d want to get rid of it in the first chapter. So there you are. All human life is there, tacked on to the word pony. What are you waiting for? Could you be the author who tackles He Wanted a Pony? And no one’s written The Instagram Pony yet. In case you’re wondering how you can find the books mentioned in the piece, here is a full list of the titles mentioned and who they’re by, in author order. Ruby Ferguson: Jill and the Perfect Pony. Myrtle Ellen Green: A Pony – Doctor’s Orders! Betty Horsfield: The Pony Fund. Christine Pullein-Thompson: I Want that Pony! Margaret Stanley Wrench: How Much for a Pony? I like the look of The Bob-A-Job Pony for some reason. I might try tracking down a copy. It's worth it if you can track it down - I enjoyed it. I found one copy, on ebay, Amazon and Abe - all from the same seller. I bought it via ebay, as it was (slightly) cheaper there. I'm looking forward to it arriving next week.